Sundasalanx: from ‘Sundaland’, the continental landmass of Southeast Asia south of the Isthmus of Kra, plus the generic name Salanx. microps: from the Ancient Greek μικρός (mikrós), meaning ‘small, little’, and ὄψ (óps), meaning ‘eye’. Type locality is ‘Kapuas River at Kampong Nibung, Borneo, 0°39’N, 112°10.5’E’. Sundasalanx species tend to inhabit turbid, slow to moderately flowing water over substrates of silt, sand, or mud in the lower parts of river basins, but apart from observational evidence that they may migrate towards the surface at dusk, little else is known of their ecology. 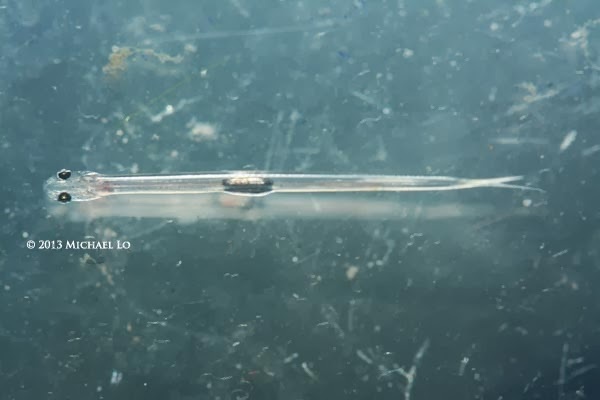 Likely to require small planktivorous food such as Artemia nauplii in the aquarium. The gut contents of wild specimens include small aquatic invertebrates and segmented worms. Unconfirmed, but likely to be a gregarious, schooling species and a poor competitor. Unrecorded, but males of the congeners S. malleti and S. megalops are distinguished from females by possessing a more intense dark marking on the lower caudal-fin lobe. This species does not seem to have appeared in the aquarium trade and is likely to prove very difficult to transport. The genus Sundasalanx is distributed throughout much of Southeast Asia and currently comprises seven species which have primarily been distinguished on the basis of oral and dental morphology, gill rakers and eye size. S. microps possesses 0-3 small conical teeth on ceratobranchial 5, 0-2 minute gill rakers on the first arch and a small eye measuring less than 4 % of SL. The grouping was originally considered related to the osmeriform family Salangidae, commonly known as icefishes or noodlefishes, but was later moved to the family Clupeidae by Siebert (1997) who considered it to represent a miniaturised clupeiform. The latter placement, but not the former, has been supported by subsequent authors therefore the family Sundasalangidae is presently considered a valid assemblage within Clupeiformes. Adults in all species are sexually mature at a size of less than 20 mm SL and evolved via a process known as miniaturisation. They resemble larval forms of their larger ancestor and are often referred to as ‘developmentally truncated’ or ‘paedomorphic’. Sundasalangidae, a new family of minute freshwater salmoniform fishes from southeast Asia. Sundasalanx mekongensis, a new species of clupeiform fish from the Mekong basin (Teleostei: Sundasalangidae). Sundasalanx (Sundasalangidae) is a progenetic clupeiform, not a closely‐related group of salangids (Osmeriformes): mitogenomic evidence. Notes on the anatomy and relationships of Sundasalanx Roberts (Teleostei, Clupeidae), with descriptions of four new species from Borneo.